In the booming world of speciality coffee, where shops open faster than I can visit/write about them, it’s nice to come across one that’s older than the Coffee Spot itself. 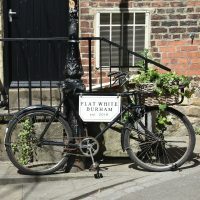 Durham’s Flat White Café, which opened in 2010, now boasts two, soon to be three, locations in the city. That I’ve not visited before now is entirely my loss, Durham being somewhere that I’ve often gone through on the train, admiring its steep hills and stunning views from the station, but never actually bothering to get off and explore. Again, entirely my loss. The original Flat White Café is a pretty small spot, a long, low rectangular space with as much seating outside as in, with the outside seating perched on whatever flat surfaces can be found. Yes, Durham really is that hilly. Given the size, there’s a surprisingly large breakfast/lunch menu, an impressive array of cakes and an espresso-based menu with options from Newcastle’s Ouseburn Coffee Co and London’s Workshop. Perpetually busy, and with tables at a premium, if you need more space, the second branch, Flat White Kitchen, is just around the corner (although up a steep hill), with more space, a bigger menu and even longer queues! My original plan had been to visit the second Flat White, Flat White Kitchen, for breakfast, but it had a queue out of the door. On a Thursday morning. At 10:30. In June. So I changed tack and went for Plan B, breakfast at Flat White Café, which I’d planned to visit afterwards. Both Flat Whites are on the steep-sided peninsular that’s the heart of Durham, formed by a large, elongated loop in the River Wear, home to both Durham Castle and Durham Cathedral. To get to the café, head down the steeply-sloping Elvet Bridge, where, halfway down on the right, before you get to the bridge, an archway leads through the wall of buildings to an equally steeply-sloping lane that curves to the left, where there’s a delightfully-secluded sloping courtyard-like area which houses Flat White Café, with a pub, Osbournes, above it. Ironically, almost nothing about Flat White is flat, other than the name (and, thankfully, the floor of the shop). There’s an abundance of outside seating, occupying every level and approximately-level surface, starting with a pair of two-person wooden tables on the right-hand side of the lane, while directly opposite the door, on the other side of the lane, there’s a small niche in the railings, home to a bench and coffee table. Flat White Café is in an old stone and brick building. A central door is flanked by two narrow windows, with an L-shaped bench around a square table under the left-hand window. To the right, under the other window, is a four-person table, with two, two-person tables to the right of that against the steps up to Osbournes. Inside, it’s long and thin, a cosy, bustling spot. Most of the seating’s on the right, while on the left, the counter, which starts one-third of the way back, dominates, leaving room for a long bench against the left-hand wall between it and the window, home to two four-person tables. On the right, another bench has three four-person tables, followed by a pair of two-person tables as the counter takes over. The last of the four-person tables creates a real pinch-point, with just enough room for a single person to get by. Sadly, the till’s at the back of the counter, so everyone has to squeeze past to order, then make their way back to their seats. It’s also right next to the espresso machine and therefore the natural place to wait for takeaway coffee. Flat White serves Ouseburn Coffee Co’s Foundry No. 2 blend on espresso, with a guest from Workshop on the second grinder. This changes as-and-when they go through whatever’s currently on, but you have to know to ask if you want the guest, which is also joined by a decaf from Workshop. I’d come for breakfast, so had the sourdough toast, two slices of rather lovely crunchy toast with a pot of jam. And, of course, I had to have a flat white. This was quite lovely, the coffee going very well with the milk, forming a rich, creamy flat white, the ideal way to start my day. Once I’d finished up at the café, I popped up to Flat White Kitchen, where they were still queuing (but inside the door this time) at 11:30. I stood at the counter (as one should) for a quick espresso of the Foundry No. 2, a rich, complex coffee with a great mouthfeel. And then it was back to the station and back on my train. December 2018: Flat White Café was a runner-up for the 2018 Best Physical Space Award. This entry was posted in Breakfast, Cafes, Cake, Coffee Terraces, Durham, Lunch and tagged include, Ouseburn Coffee Co, Workshop by Brian Williams. Bookmark the permalink.